No matter what your reason is for needing fast emergency cash, here at Illinois Title Loans, Inc. we have got you covered. Through your local store, you could get the Champaign title loans that you need to get anywhere from $100 up to $4,000 in cash as soon as today. After you have filled out and submitted the form, you can expect to receive a quick call back from a friendly store representative, who will help you get started on the title loan process. They will answer any questions you might have and make sure you have the simple required items listed below. Once your phone call is completed, it’s time to head on over to our store location in order to complete the process. When you get there a loan specialist will be waiting to help you complete the necessary paperwork while a manager performs a quick inspection of your vehicle. After everything is done, you could get the cash you need right then and there. Best of all, you will be able to continue driving your car as you repay your loan. So what are you waiting for? The process is so simple and quick, there’s no reason not to get started now and let Illinois Title Loans, Inc. help you get the emergency cash you today! 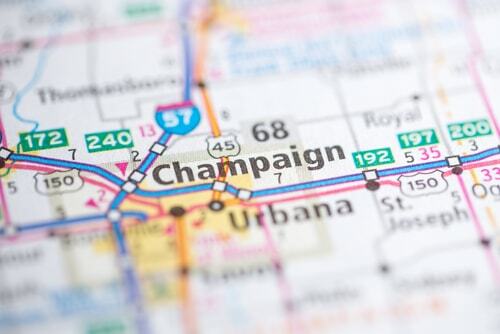 We proudly serve residents of the greater metropolitan area, from Champaign to Urbana, and Rantoul to Danville. Regardless of what your credit history looks like, you could get up to $4,000. The fast cash you've been looking for is waiting at Illinois Title Loans, Inc.! Why Choose Us for Your Champaign Title Loan?